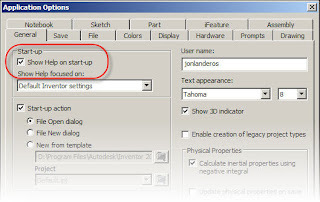 In between the usual schedule, here's the first tip for Inventor 2008. I've noticed that Inventor is trying hard to be helpful, and when you first start it, will always want to bring up the help system. That's all fine and dandy, and could be a really helpful feature. However, there comes a time when you'd probably want to turn it off. If you go into your Tools>Application Options, and uncheck the 'Show Help on Startup' Option, you can disable this feature. It'll be on the general tab.